Results from the VMST David Gregg III Memorial meet have been uploaded. The meet was held Feb 9-10 at the NOVA Aquatics Center in Richmond, VA. It was attended by 128 swimmers, 108 from our LMSC representing MAC (4), POWM (12), QMST (9), STON (4), URMS (4), VMST (54) and WVMS (2). Eight new LMSC records were set at the meet; they are listed below. 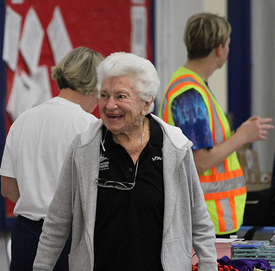 While Laura Walker and James McFarland were impressive with two records each, the meet clearly belonged to swimming phenom Marie Kelleher, who became the first USMS female swimmer to compete at 100 years old. Her 50 free time naturally set a new national record. The Richmond Times-Dispatch ran an excellent article about Marie and her swim. Congratulations to all the participants and the volunteers for putting on a wonderful event. David Fellowes took some nice photos of the meet; if you have any pictures you would like to share with the LMSC, please let me know.